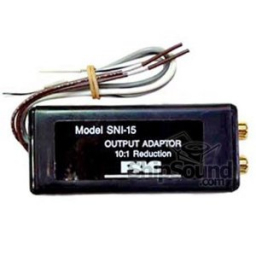 Car Stereo Amplifier Location: Full range amplifier is mounted under the rear deck. The subwoofer amp is attached to the subwoofer under the rear deck. But it just doesn't really have any bass over the factory sub. I'm running a alpine m500 amp with a 8" alpine type r dvc 2ohm sub. Also I have the convertor wired up at the factory amp. Thanks for any help or a point in the right direction. I would wire the converter from the rear speaker terminals (subs) to the amp. Also some converters are adjustable and they are usually sold turned down. Pic of the converter? It should be pounding. Try turning the gain on the amp all the way up? Does this help? Do you have a bass knob? Make sure to get a bass knob, this will be the only way to control it. So unhook it from the amp harness and connect to rear deck speakers ? Last edited by 06BlckMax; 03-10-2013 at 08:07 PM. Just went out and changed it now it works great. Thank you for your help fellas.